4.1.6.10 Pursuant to RCW 43.09.230, Annual Reports are to be certified and filed with the State Auditor’s Office (SAO) within 150 days after the close of each fiscal year. X Required to be prepared by special purpose districts and other entities and submitted to SAO. N/A Not applicable; not required to be prepared by special purpose districts. 4.1.6.20 Local governments with total revenues of $2 million or less are not required to prepare C-4 or C-5 statements unless debt covenants, a contract, a grantor or the district’s legislative body requires the district to prepare the financial statements or to receive a financial statements audit. If this request is made, C-4 and C-5 statements and notes should be prepared. The $2 million threshold calculation excludes any proceeds from issuance of long-term debt and resources held by the government in its fiduciary capacity. Local governments which choose not to prepare C-4 and C-5 statements must have their budgeted information available for the audit. 4.1.6.25 Local governments with no financial activity, defined as having neither expenditures nor revenues other than interest income on any cash balances, have the option to submit summarized annual reports. These governments need only to submit a Schedule 01 reporting cash balances at the beginning and end of the reporting year as well as any investment income received on those balances if applicable. Note that by selecting this submission option, preparers of the annual reports are certifying that their government meets the definition of not activity as explained above. 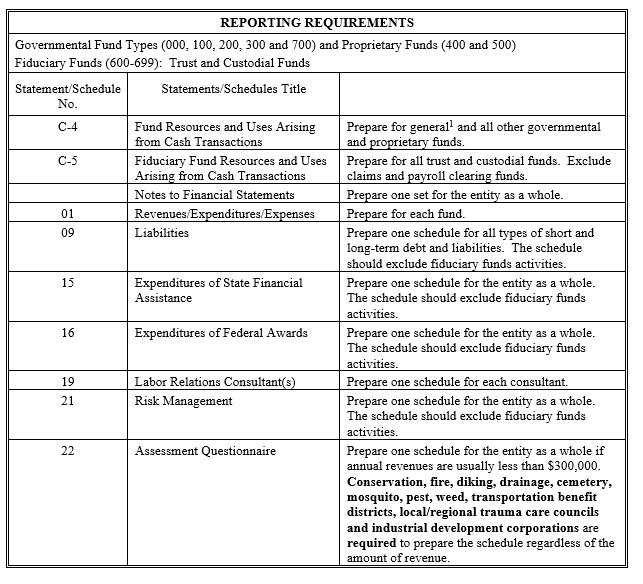 4.1.6.30 If more than $750,000 in federal funding was expended by the entity during the year and a federal single audit is required, the entity must prepare financial statements if it has expenditures of federal money from more than one program or cluster. However, an entity that normally does not prepare financial statements may not need to prepare them for the single audit if it has expenditures from only one program or cluster. Entities should consult with their local SAO team or the SAO HelpDesk if they have questions about this requirement. The templates for Online Filing for Schedules 01, 09, 15 and 16 are available on SAO’s website page, BARS Reporting Templates. When using the Online Filing option, the system will create the Schedule based on data provided by the districts on these templates. 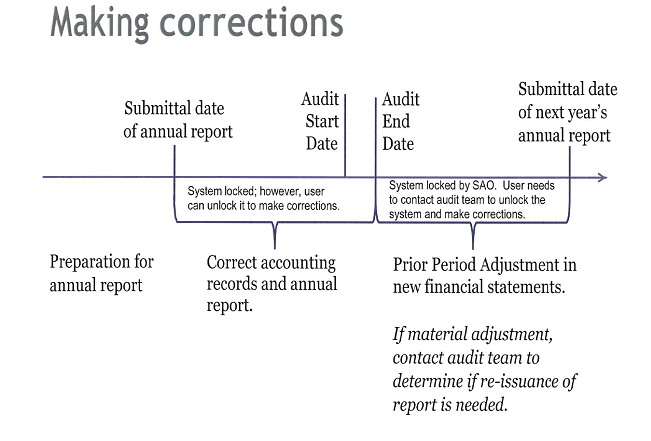 Electronic reporting is encouraged when filing annual reports. Annual reports should be submitted via the Online Filing option on the State Auditor’s website at: SAO. Acceptable file should adhere to the prescribed record layout and should be an Excel file. It should include column headings. All columns must be formatted as text except the Actual Amount column which is numeric. More details are provided on the website. Prepare the Certification, sign and date the certification before submitting the report. 4.1.6.80 The following matrix describes required statements and schedules for cash basis special purpose districts and the scope of each schedule. Please check if the statements/schedules are attached. Use the column which is appropriate for the district. If financial statements and/or Schedule 22 are not applicable mark the spot NA (not applicable). An unmarked spot will indicate that a schedule is not attached due to lack of activities described in this schedule in reported year. Conservation, fire, diking, drainage, cemetery, mosquito, pest, weed, transportation benefit districts, local/regional trauma care councils and industrial development corporations are required to prepare the Schedule regardless of the amount of revenue. Only special purpose districts with revenue of $2 million or more are required to prepare the financial statements. See the Caution on the previous page.